Congratulations to Elaine Fink, Legal Aid’s Managing Attorney for the Children and Education practice group! She received the 2016 Denis Murphy Award from the Ohio Legal Assistance Foundation (OLAF). 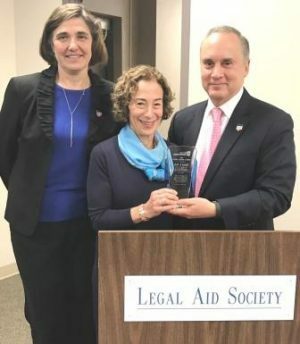 David Kutik, president of the OLAF Board of Trustees, along with Angela Lloyd, executive director of OLAF, presented the award which recognizes outstanding leadership and advocacy within Ohio’s legal aids. As an additional honor, leaders from our partners at Cincinnati Public Schools, Hamilton County Juvenile Court, Cincinnati Children’s, Northwest Local School District and Hamilton County Job and Family Services joined the Legal Aid Staff and Board for the presentation.